Wonder what vixen would wear this V? I’m sure she’s out there, causing a ruckus and raising a fuss. After all, that’s what Vixens do. A foray into right angle weave. 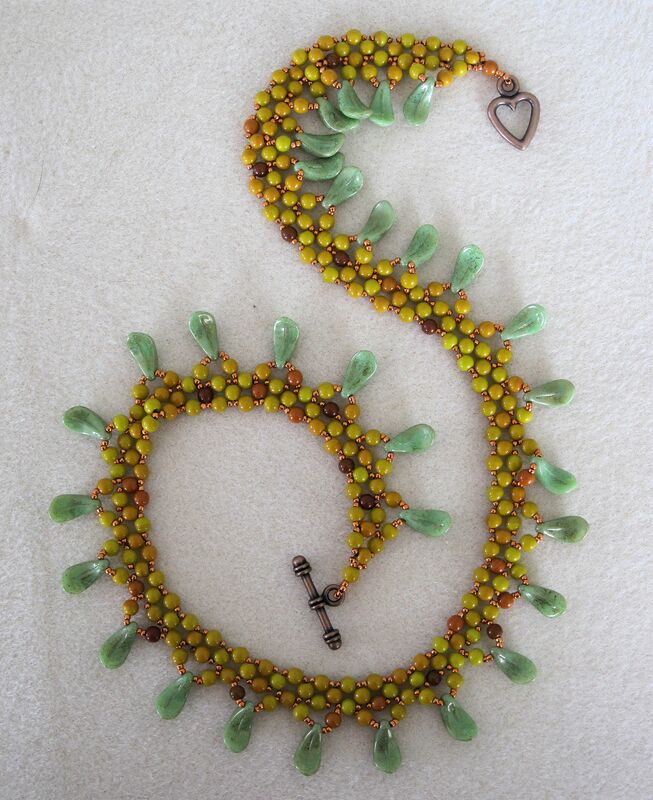 With seed beads. Which took a very, very, very long time to complete! The Vs are quite architectural and sturdy. Almost stiff, which is what they’re supposed to be. Right angle weave is not a fluid stitch; it creates structure. Those sections are joined with crystals. What the close up reveals is that there is more color to this piece than what the eye first sees. In between the dark broody iris beads is a wealth of bright metallic seeds. The remaining necklace is strung druks, because the human body is not angular. Necklaces should lie against the neck, not poking out in odd angles. Sometimes, you want something a little edgy, without crying out to the world that you’re unique and different. Like a glowing question mark hovering overhead: is she, or isn’t she. That’s what prompted this necklace. I saw some micro daggers (actually part of the Crystaletts product line) which got me very intrigued. Teeny tiny button-like daggers. Oh my! This is the result. 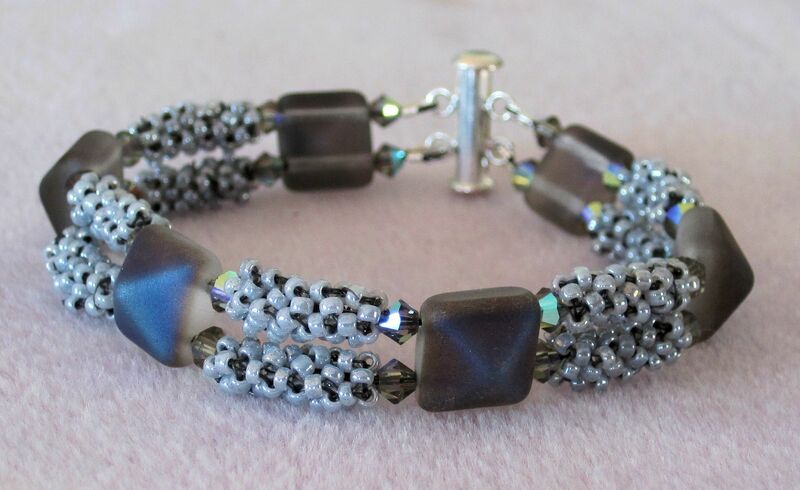 The gunmetal color of the daggers and beads plays off nicely against the firepolished crystals. The crystals are a mauve/maroon/grey color mix. The necklace was stitched using tubular right angle weave (t-raw for the acronym enabled), then embellished with gunmetal size 6 beads and the spikes. The black chain used as an extender was also hand made. So, will I be making more of these, as is my wont when I discover something new? No. Absolutely not. This necklace took a half-mass of crystals. That’s 600 beads. Until I’m once again able to visit the Tucson Gem Show, that is waaay to much stash for one necklace. Sinuous curves for the curvaceous Josephine. Not the Empress Josephine, but Josephine Baker. That’s what this necklace reminds me of: Josephine Baker performing in Paris Folies Bergere wearing her banana skirt. Shimmy! Shimmy! Skake! Shake! I suppose it’s the green drops. I have seen them alternately called claw or petal beads. They have a distinct curve. Fun to look at, but requiring concentration to use if they’re all to curve in the same direction. Right angle weave done with variegated mustard druks and accented by bright copper 15°s in between. This photo absolutely does not do the pyramid beads justice. They are the loveliest deep dark blue, like the depths of the ocean you see in those submersible documentaries. It is also, unfortunately, darned difficult to photograph! Deep dark pyramids, with steel crystals and stitched tubes. The seed beads are not quite grey, and not quite silver, like ocean spray. The tubes took forever! Not because they were difficult, but because I tried to do them at night. In poor lighting. Away from home. Not recommended. In the end, though, the effort was worth it. This bracelet turned out better than I imagined. Glinty. Steely. Sparkly. 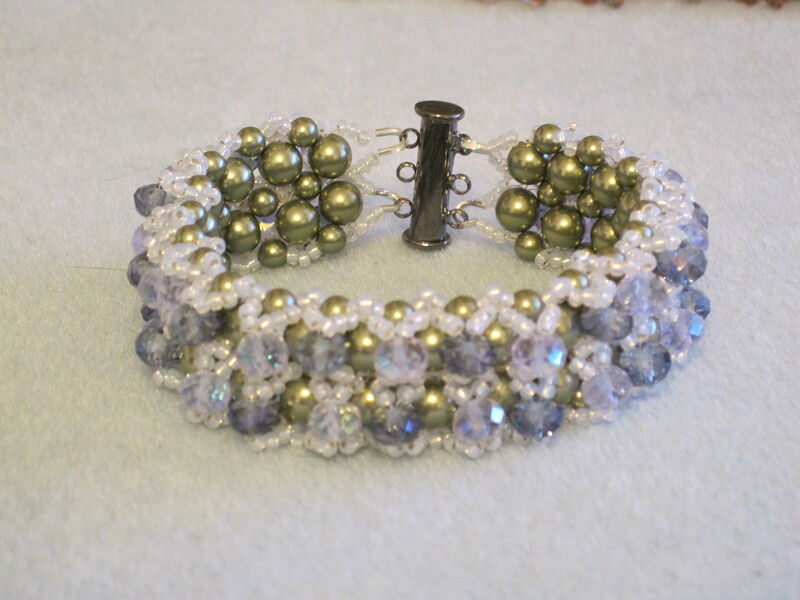 This bracelet was another exercise in using some of the new bead shapes that have come on the market. Though now that it’s finished, it very much reminds be of a painting in the Phoenix Art Museum – 19th century woman wearing a long white day dress. Closer inspection shows the white dress to be anything but. There is pink and blue and lavender and yellow. I want to say the painting is by Gainsborough, but that is probably wrong. 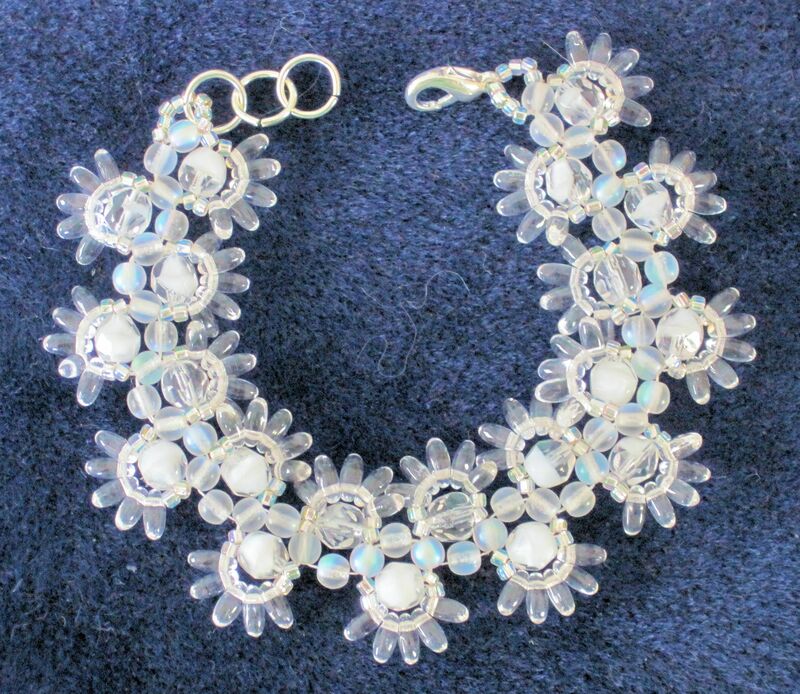 So, this bracelet was supposed to be made all of crystals, except they look so very different when put together. The large central beads are part white / part crystal, then there are crystal clear rizos (the new bead shape) as the dangles; the small round druks have a bit of a mercurial finish to them, seed beads with a silver lining. I am pleased. It came out much better than expected. Hmmm, I wonder if there are other color combinations hiding out in the bead boxes that are more than they appear. What do you think? A double-wide caterpillar, if you will. Kind of reminds me of the ones found on tomato plants, only much, much nicer. This was an experiment. I wanted to see if using a base twice the suggested width would work with the crystal embellishments. It does! 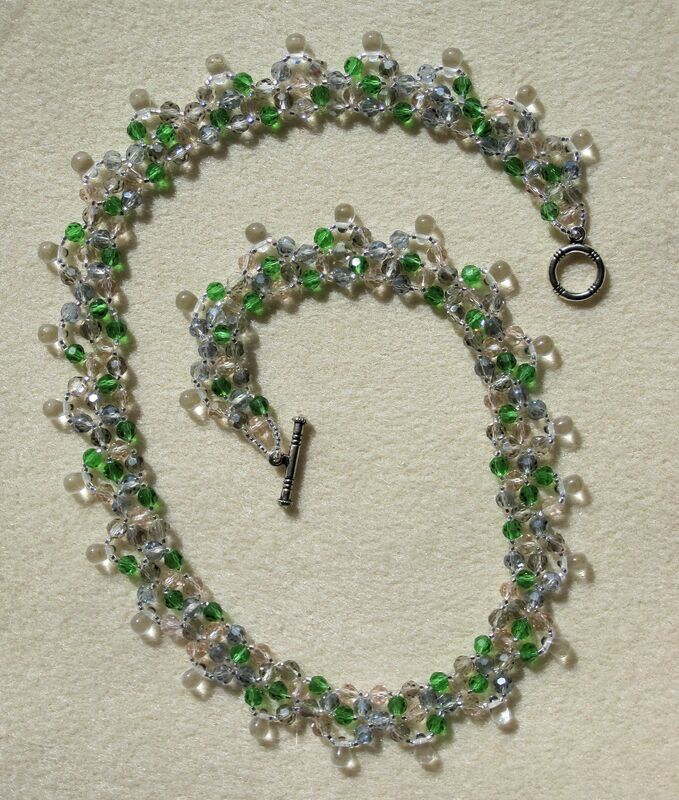 Swarovski pearls in right angle weave, with crystal embellishment on the base. It’s a little difficult to see, but there are two different crystal colors – a pale grey and a blue. The green pearls had the same issues with the color coating as the coral did. Easy to fix, but still disappointing. Stitching the crystals required trial and error for a couple of rows, as I wasn’t sure how best to apply them. One long row first, then the second, or to zigzag back and forth from one side to t’other. When all was said and done, it didn’t really make any difference. I’m not usually prone to crystals, but this time they work quite well.